Today, we are talking about evictions. Every real estate investor or landlord has questions about evictions, or has faced an eviction in the past. We cannot totally eliminate this risk with your real estate investment, so it’s important that you know what you have to do when you’re evicting a tenant. In Texas, it takes 30 to 45 days to evict a tenant. There are a few variables affecting this date range, such as when and how you serve the Notice to Vacate, which is required to start the eviction proceedings. Timing also depends on the caseload of particular courts. We have justice of the peace courts throughout the DFW area, and we have different ways to verify which precinct a property belongs to. Even before we file the paperwork, we verify which court is assigned to a particular property. In north Texas, it costs between $120 and $140 just to start an eviction case. That’s for one defendant only. If you have multiple defendants, there is a fee for each additional defendant. You’ll want to check your local justice of the peace so you know the correct filing fee. Serve the Three Day Notice to Vacate. If there’s a notice requirement in your lease that’s different from this time period, you’ll want to follow what’s in the lease. Generally, it’s three days. You can mail the notice, but then you will have to allow an additional two days for mailing. Or, you can post it on the inside of the front door. Sometimes, it’s not possible to get into the unit to post the notice on the inside of the door. It can even be a little dangerous. So, in many cases, it’s better to mail your notice. Proper notice is essential. If you don’t fill out and serve the notice properly, you can jeopardize the rest of your case. If your tenant does not vacate after the notice is given or bring their balance to current, you can file for eviction. In our justice of the peace courts, you’re not required to be an attorney or to have an attorney in order to file. Many people will file the eviction on their own. However, there are some great eviction services available, and they aren’t expensive. They can help you when you’re evicting a tenant. After you file for eviction, it generally takes one or two weeks before you get your court date. According to Texas Property Code, it will be up to 21 days to have your case heard by a judge. Once you file, you’ll know your court date. The constable’s office handles serving your tenant, and if there’s a problem with service, it could delay your court hearing. Verify with your court that the tenant was properly served. Arrive at court a little early. It’s important that you’re on time and ready to present your case. Have a copy of your ledger, your lease agreement, the notice to vacate, and any other supporting documents. At King Realty, we are not attorneys. We have dealt with numerous eviction cases, but if you’re not comfortable going to court or you don’t know what to do, consult with an attorney or use an eviction service. People have done it on their own successfully, but there are a lot of little details that need to be followed so your case isn’t thrown out. Present your case to the judge, who will hopefully rule in your favor. Then, you’ll receive a ruling that grants you possession of the property as well as the rent that is owed. They will not rule on utilities, late fees, or other costs; you’ll be awarded a judgment for rent only. Once the judgment is rendered, your tenant gets five days to vacate. If the tenant does not vacate, you’ll have to go back to the justice of the peace to get a Writ of Possession. Fees vary. We have seen the amount for a Writ of Possession between $160 and $185. The constable gets the paperwork after the Writ of Possession is ordered, and puts a 24 hour notice on the door. Then, the constable contacts the landlord to set up a time to execute the writ. The constable will meet you at the property, and it’s important that you bring people who can help move out any of the tenant’s belongings. You’ll have a one or two hour window to remove any remaining tenant belongings while the constable is there. You can remove the belongings from inside the property and put them at the curb. Time is of the essence because the constable charges additional fees if it takes you longer than those two hours. Being in communication with your tenant will help. 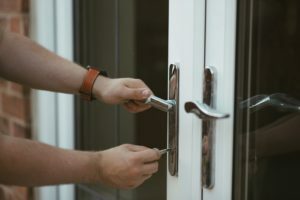 Usually, the tenants vacate with their belongings, but there are some more difficult tenants out there who will have to be physically removed. Have someone rekey the property immediately. This ensures the evicted tenant does not have access to the property. That tenant cannot go back in and do damage. You’ll want to do this immediately once the belongings are out. It’s important to know you cannot change the locks on a tenant who is still in the property, even if they haven’t paid rent. You must go through the formal eviction process. If you have any questions about the eviction process or how to protect your real estate investment in Dallas, please don’t hesitate to contact us at King Realty.